Today we are so excited to be partnering up with Boobyball! What is Boobyball you ask? It is a party thrown by rethink breast cancer raise awareness and money for young women with breast cancer. It is such a fun night that happens in four different cities in Canada! We will be at the Toronto party, so be sure to get your tickets here and come and hang out with us (check out the info here!). SOO, since Boobyball is around the corner we decided to make some fun party decor DIYs to match this year’s theme, Wild West! Let’s get started! So buffalo skulls are totally a staple in any wild west themed anything, but we don’t really like the idea of having a real one hanging up on our wall. SO, we decided to take a plastic one and jazz it up! We started by grabbing this inexpensive plastic skull at a local part store (but you can find one here). We ended up only being able to find a ram skull, so we decided to remove his horns and create new ones to fit the buffalo skull vibe we were going for. We decided to craft some new horns out of some aluminum foil! We tucked the new horns into the plastic where the old horns used to be. To hide the foil, we wrapped the horns in some jute rope with hot glue! We then hot glued the horns into the plastic to hold them in place. Time to give this skull a GLAM makeover! We grabbed some plastic colourful rhinestones and covered the eyes and base of both of the horns in them. 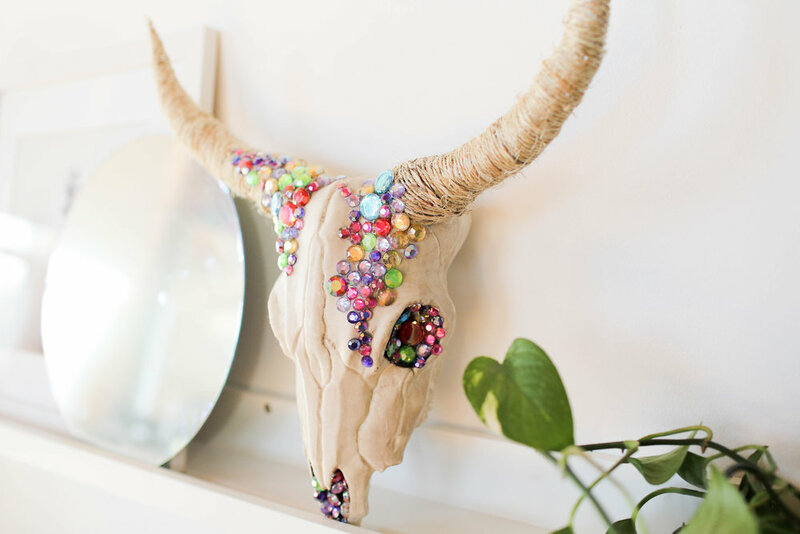 You can totally be creative with this step, but we really liked the look of groups of rhinestones that faded into smaller ones down the side of the skull. And that’s it! This is perfect for halloween BUT also the rest of the year because it’s just gorgeous? We’ll be making this ring holder out of some oven bake white clay! We rolled a piece of it in a ball and flattened it to create a disk. We used a rolling pin to roll it out flatter, and used a cup to cut out a perfect circle shape. Use your fingers to mould the edges to create a lip around the dish. Next, take more clay and roll it into a long skinny shape. You want this to be thin enough so that your rings fit over it. Use an exacto knife to cut a long piece to act as the middle base piece of the cactus. Next cut two smaller pieces to act as the arms of the cactus. To attach the pieces together, score both of the contact points (on the end of the arm and on the base) and attach the pieces together using your fingers. Next, use a toothpick to score the cactus and create lines to make it look a bit more realistic. Place the cactus and dish on a baking tray and bake according to package directions. Once baked and cool, use some super glue to attach the cactus to the base! As a final step, we are going to dip dye the bottom of our cactus! To do this, we poured glossy mod podge into a thin but deep container and added a bit of pink paint to tint it. Dip the bottom of the cactus in this mixture and take it out, allowing the bottom to drip away. Place the ring holder on something like an open can, this allows the holder to try without too much of the bottom touching another surface. Once the pink was dry, we painted the top with a clear gloss! We decided to make a giant (and plush) version of this classic game, because giant things are more fun AND the plushy horseshoes are safer for party goers. Start by picking up fabric in two different colours, about a yard and a half of each colour. We decided to use a thick canvas to ensure that our horseshoes wouldn’t break while we are playing. 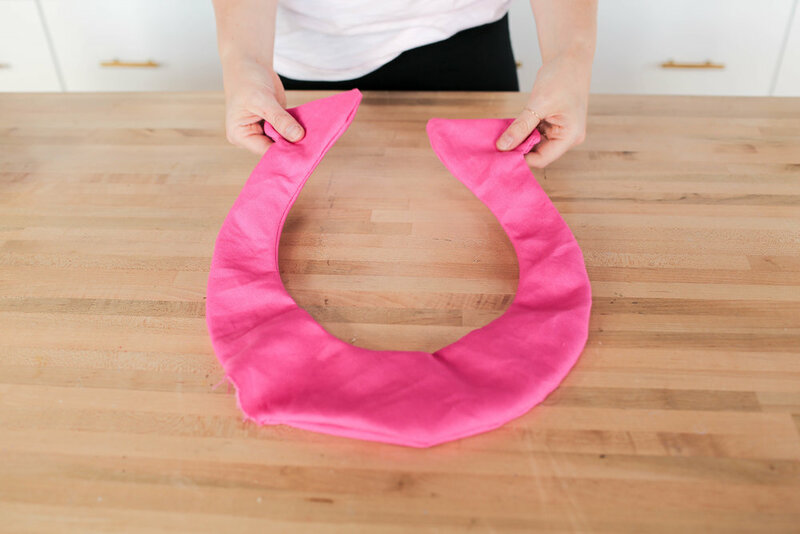 Cut out our horseshoe template (linked here) and trace it out onto your fabric folded in half. When you cut this out, you will have the two identical sides to create the horseshoe! Add a bit of seam allowance around the template as well. Next, cut out a piece of cardboard in the horseshoe shape (without seam allowance) and add it between the two pieces of fabric. Add a serger or zig zag stitch around the edge of the shape, leaving a gap to allow for stuffing! Stuff with batting and sew up the holes you left behind! Time to make the pole for the horseshoe game! We cut a ¾ inch dowel into two three foot pieces. In a disposable container, mix together some standard concrete using four parts cement and one part water. Fill the container until you have about three inches of concrete. Place your wooden dowel into the center of the concrete and use tape to hold the dowel in place. Let dry, pop out the cement base, and repeat for the other wooden dowel. To bulk up the poles, we are placing a pool noodle cut to three feet over top of the wooden dowel. With the leftover fabric from earlier, we are going to make a slip cover for the noodle polls. Trace the length of your noodle, and cut a strip of fabric that can be wrapped around to cover it with some seam allowance. Pin this piece to a circle that is the size of the top of your noodle with about a half an inch with seam allowance. Next, sew up the side of your slip to finish! You can now add your slipcovers over the pool noodle stands. Time to cover up the concrete bases. We grabbed this super affordable shaggy rug from Amazon (check it out here), and cut it in an organic oval shape. Be sure to push the fur to the center of the rug when cutting to make sure you aren’t cutting too much of the fur off. In the very center of the rug, we are going to cut an ‘X’ shape so that it can fit over the pole. Now you’re ready to play! Be sure to check out Boobyball and come hang out with us at the Toronto date! Check out tickets and deets here! Also be sure to check out the video below! Weighted Blanket - Cozy and Relaxing DIYS!